Financial support to attend an approved conference / seminar relevant to their venture. Recognition at the Champions of the Bush Award Celebration, a gala event held in a regional city, where the finalists' achievements are profiled before the media. The Award is open to regional entrepreneurs employing less than 300 effective full time (FTE) employees, and which have demonstrated real innovation and entrepreneurship in their operations and/or products. 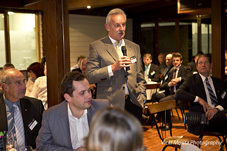 Entrants may be any ASIC category, any enterprise sector, social entrepreneurs, and not for profits are also welcome. Entrants may nominate themselves or be nominated by third parties and we particularly encourage all municipalities to submit nominations. And the 2013 winner was... Flavorite! 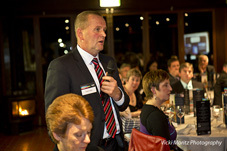 The 2013 Spirit of Entrepreneurship Award was held at Spoons Riverside in Swan Hill, Friday 18 of October 2013. 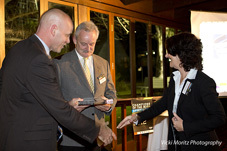 The winner of this year's award was Warragul's Flavorite. Flavorite was founded in 1994 by Warren Nichol and Mark Millis. 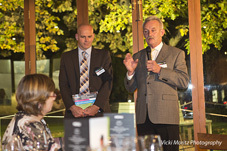 Flavorite have revolutionised the tomato business in Australia. The Nichol and Millis families have ensured that after 45 years, you can now buy top quality, juicy red tomatoes all year round wherever you travel in Australia. With the support of a dedicated network of growers and few other stalwarts from the Hydroponic Farmers Federation, they have taken a cottage industry to a major supermarket category. Read more about Flavorite by visiting their website - Click here to learn more. Alan Wilson Insurance Brokers (Traralgon) - AWIB was established by Alan WIlson in 1984 when he purchased a small insurance business in Traralgon which employed one person. Since then AWIB has grown considerably to become one of the largest insurance brokerages in regional Australia employing 15 staff. 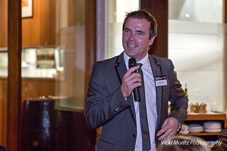 In 2012, Alan won a national insurance industry award knows as the NIBA - Broker of the year award. Alan has particular expertise in the design of fire protection insurance policy and this is acknowledged nationally. Dunstan Farmers Engineering (Kerang/Ballarat) - The Dunstan brand has been established for 50 years, supplying Australian farmers with quality, innovative and technologically advanced harvesting equipment. Dunstan's invest heavily in research and development, and aim to provide world class products by adopting the very best in design, development, manufacturing and testing processes. Mildura Fruit Company (Sunraysia) - The Mildura Fruit Company originated as a Co-Op more than 100 years ago. Today MFC is owned by Manassen Foods. MFC prides itself on being a grower oriented company. It operates a grower service team of six, focused on a six point quality control program and ensuring consistency in orchard through to packing and delivery of the end product.Products grown for and packed by MFC include oranges, mandarins, lemons, avocados, and grapefruit. Over 120 citrus growers in the Sunraysia region supply MFC. MFC packs about 3.5 cartons of fruit every year for the domestic and export market. North East Survey Design (Wangaratta) - NESD was established on September 2007. The business currently provides services in the following areas: Civil and Structural Engineering, Surveying, Planning, Urban Design, Landscape architecture, Project Management, and many more. These services are provided to government institutions and private developers throughout North East, Central and Northern Victoria. The organisation currently employs a total of 14 staff with a view to continue to grow over the coming years. Rubicon Water (Shepparton/Hawthorn) - When Rubicon was formed in 1995, the directors envisaged a future of water scarcity in Australia and in many parts of the world, at a time when water scarcity was hardly and issue. With their knowledge of the irrigation industry, it was obvious to them that a large part of the solution lay in reducing the amounts of water lost to productive use in inefficient, large scale irrigation conveyance systems. Rubicon has successfully produced and marketed world class irrigation technology both domestically and internationally. Western District Employment Access (Warrnambool & Western Victoria) - WDEA has been providing individualised employment services in Western Victoria since 1989. Since then, it has grown to become one of the largest community and employment service providers in the region, employing over 280 people across 15 different sites in a range of community based services and programs. WDEA is a national leader in the provision of employment opportunities to the disabled. 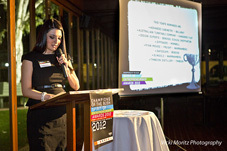 Champions of the Bush also recognises community groups that volunteer their time to better their local community. This award is called 'Community Spirit'. 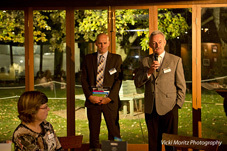 This year's Community Spirit Award was the Swan Hill Uniting Church Community Issues Group. The Swan Hill Uniting Church Community Issues Group, is a group of approximately 15 volunteers that provides food drops, housing information, and other practical assistance to refugees who are coming to the Swan Hill region from detention centres elsewhere. The Convenor is Jill Pattenden and the Secretary is Jan Ellemor. The work of the Swan Hill Uniting Church Community Issues Group is an inspiration to the region and the nation. 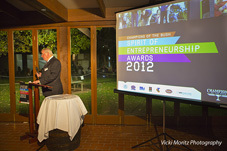 The 2012 Spirit of Entrepreneurship Award was held at Brown Brothers Vineyard in Milawa Friday 1 June 2012. The winner of this year's award was Kangaroo Flat's Australian Turntable Company. Australian Turntable Company was founded 20 years ago by Executive Chairman Paul and Annette Chapman. It is a family business that has grown from small beginnings, from the construction of turntables for the exhibition industry to the development and installation in Iran of the world's largest revolving restaurant with a 50-metre diameter. Now headed by two generations of the Chapman family, Australian Turntable Company's profile and reputation as a global leader in the provision of high-precision rotating solutions continues to grow. It currently sees the company working on export projects in Iran, UAE, France, Las Vegas, and the UK. Read more about Australian Turntable Company by visiting their website - Click here to learn more. 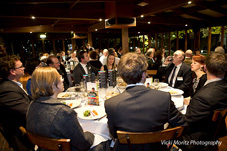 The 2010-2011 Spirit of Entrepreneurship Award was held at Narbethong's Black Spur Inn on Friday 25 March 2011. The winner of this year's award was Warrnambool-based company FreshBins. FreshBins is a robotic bin cleaning system that uses world-leading technology to clean and sterilise household and commercial wheelie bins utlising environmentally-sustainable practices. With the capacity to clean 1000 bins in one shift, the FreshBins operation is so finely-tuned that it can clean a bin using less than one cup of water. This amazing enterprise was created by Paul Sewell, a former plumber and welder and is operated from his home of Warrnambool. 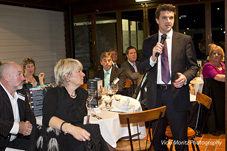 The 2009-2010 winner was ‘Enterprise Cruises’ of Paynesville in East Gippsland. Owner Roelf Aukema and his wife Juliette were present to receive a handsome trophy from the Swinburne University Director of MBA programs Dr. Julian Lippi. Crawford Kitchens is a containerised kitchen catering unit. Andrew Crawford has catered for motor racing teams in Australia, New Zealand and Bahrain for over 20 years. He designed the first unit in 2004. Ten units are now in use with a wide variety of organisations. The business now has over 200 clients and serves more than 60,000 meals each year. Based at Mansfield and employing 15 people, the Crawford collection proves necessity is the mother of invention. Whatever it takes to make an entrepreneur in the Bush, the one common thread is the will to "have a go". When Victorians Alan and Shelley Green hatched an idea to start their own free range egg business in 1999, they knew the risks were high. They were already selling eggs to a few local outlets, but to market free range eggs by themselves, 100 percent under their own brand name, was a quantum leap. 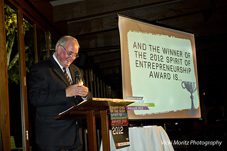 The fruits of their calculated risk, hard work and canny marketing were recognised when Green Eggs took out the Spirit of Entrepreneurship Award Provincial Victoria 2007. 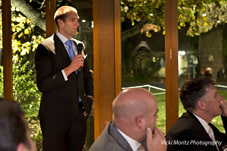 Sponsored by Champions of the Bush Inc. and the Swinburne University Australian Graduate School of Entrepreneurship, the award recognises businesses and organisations who have demonstrated real innovation and entrepreneurship in provincial Victoria.